Please find the “raw” information with the full press release sent by Blanca Menchaca, BeMyGuest’s CMO. This might be a happy ending for Indiescape founders who were appeared on most of travel and startup portals in Asia. But they don’t really have much experience in this competitive field. From what I knew from them from the early stage, they could have a good inventory but didn’t know how to marketing and sell the local tours. So their inventory would be good for BeMyGuest. This could also be an aqquire-hire to support for the talent pool of BeMyGuest this period. Singapore, January 15, 2014 – Asia’s leading aggregator of local tours and activities, BeMyGuest (www.bemyguest.com.sg), announced today the acquisition of former competitor, Indiescapes (www.indiescapes.com). 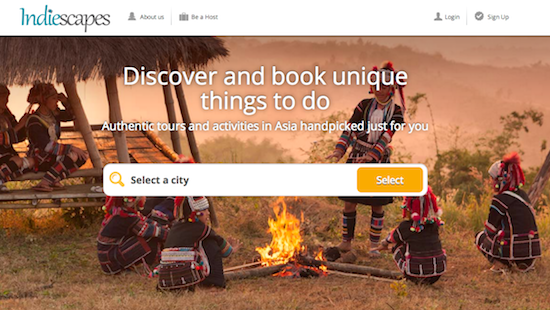 The move integrates Indiescapes’ hundreds of curated travel experiences across South East Asia, adding to the enormous range of individual local experiences already offered on the BeMyGuest site. who seek individual and immersive travel experiences beyond the commercial package tour framework. The acquisition comes just a month after angel funding in BeMyGuest by South Korea’s third largest OTA, Tidesquare, and the successful investment of SGD$500k in seed funding in October, 2013. BeMyGuest provides tour and activity businesses with free content management technology. These local travel businesses undertake little or no online marketing, to connect and market their travel experiences to travellers. The tours and activities sector is now widely acknowledged as the final frontier in travel distribution, largely unavailable and noticeably absent from the content currently offered by leading OTAs and GDSs. PhoCusWright, a market research leader in the travel industry, state that four in five travellers seek tour and activity options when planning their travel arrangements online, with the tours and activities sector valued at an estimated $100 billion per year globally. BeMyGuest successfully fills this gap by providing travellers with the unique destination experiences they seek, while empowering local businesses with free technology that allows them to digitalise their products and grow their businesses online. Currently the site partners with more than 250 suppliers, SMEs and individual operators. Suppliers are provided with a free content management system, distribution of products through the BeMyGuest site, travel partner syndications, travel comparison tool, SMS booking confirmation, free marketing activity both offline and online, all streamlined and tailored to the Asian market. BeMyGuest is a fully licensed online travel agency, with a focus on providing authentic, local tours and activities to travellers. They aim to bring the benefits of tourism to local communities through promoting and supporting local and independent businesses, by empowering them with free content management technology. Launched officially in October 2012, the website allows guests to have access to a wide choice of local tours & activities, especially across Asia.